GIVE A MUG. GET A MUG. We all enjoy a nice hot mug of coffee or tea, right?! Well, I just signed up for the 3rd annual ACuppaKim #MugSwap2013 today! I got wind of it through an IG friend. After reading her post about it, I thought I'd join in on the fun. Today is the first day of sign-ups, so if you think it'd be something you are interested in, check it out! The deadline to sign up is August 7, 2013. 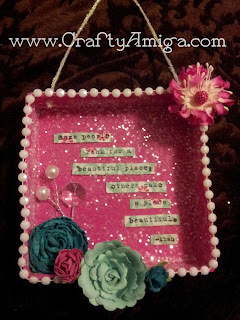 You can also visit Kim's Blog (linky party) to see the pics of the mugs & goodies everyone received in the swap! I was in after viewing all the great pics! Spread the word. The first annual swap had 44 participants. Last year there was 240+! #BuildABanner Workshop at The Makery So Cal! Workshop #2 - Come and Build-A-Banner in my next workshop at The Makery So Cal! The workshop will be held on Friday, August 9, 2013 from 6:00 pm - 8:00 pm. Cost of the workshop varies between $16-$24, depending on the size of the banner you choose. Please be sure to include the word that you are going put on your banner when checking out. The workshop can be paid via the "Buy Now" button below. The banners will be created using burlap and canvas banner pieces. You will have the option of painting the banner pieces or not. 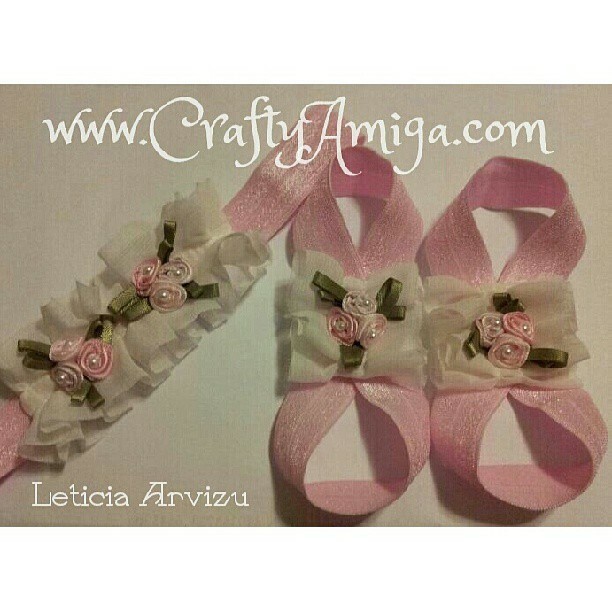 We will be embellishing them with ribbon, lace, paper flowers, buttons and bling! I will provide light snacks & refreshments. Bring a friend, the more the merrier! *Pre-payment for this class is MANDATORY. I will need to pre-cut the letters for the word you choose, so I need to know ahead of time. My daughter is pregnant, due November 17, 2013. It's a girl! I am so excited to become a Grandma. My daughter seen thee most adorable barefoot baby sandals online. So, I decided to get crafty and make some! I whipped out some supplies that I had on hand for bow-making and headbands. So while I was at it, I decided to make a matching set. Using fold over elastic (FOE), I made a figure 8 shape using approximately 10 inches. I glued it in place with some Fabric Tac, covered the glued area with a circle of felt and embellished the top part. Easy peasy! I've decided to make some extras to sell as well! My grand-daughter is going to be so spoiled! She'll be looking real cute with all the things I am going to make her! 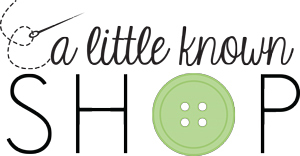 Countdown for Crafty Night In at The Makery So Cal! 10 days to go! 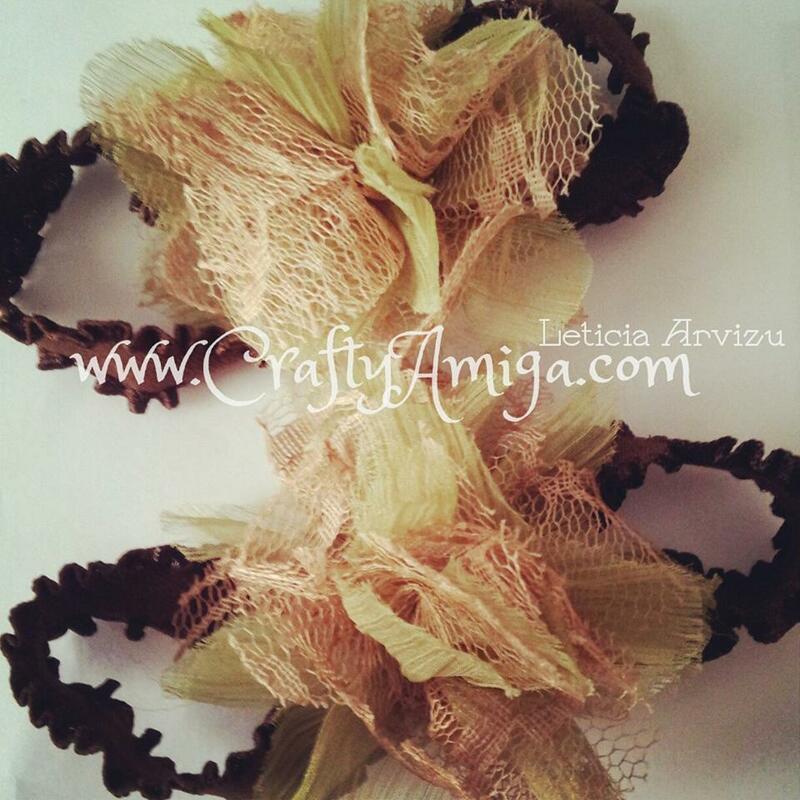 Join me to create these 3 great projects. Be prepared to get glittery, gooey fingers! 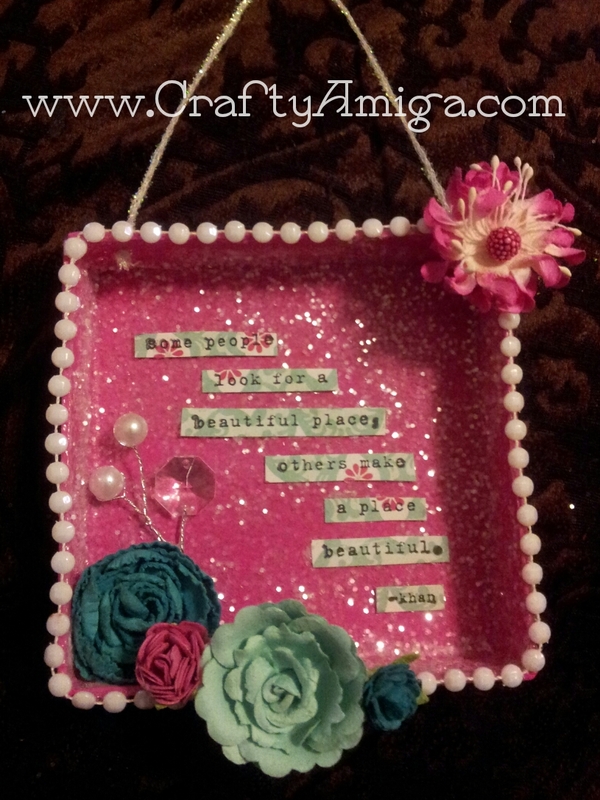 We'll be decoupaging a candle, glittering a paper mache box and embellishing a journal. Be sure to secure your space, this workshop is limited to 18 people. 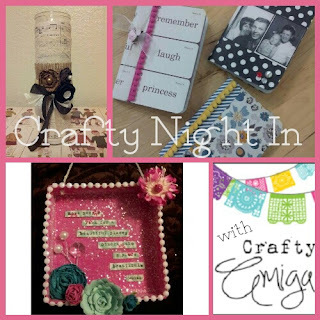 or you can "Join" my facebook event page: Crafty Night In with Crafty Amiga. Again, here are the details: Fri, July 26, 2013 from 6:00p-9:00p $18 per person. I will be providing light refreshments & snacks, feel free to bring something to share if you'd like! I look forward to crafting with you all! I love when I receive a custom order! 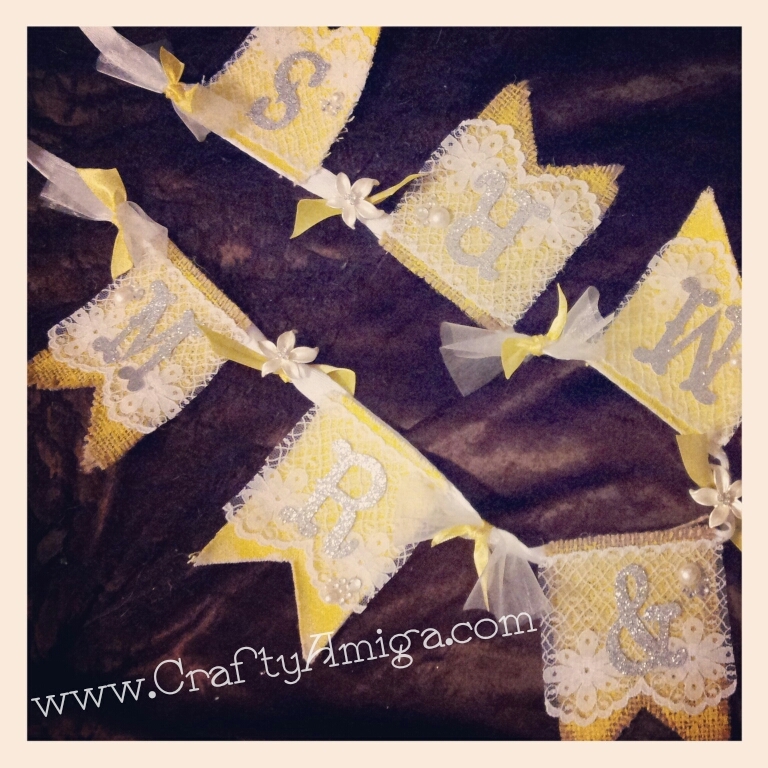 Recently, I was contacted to create a custom "MR & MRS" wedding banner. A customer from A Little Known Shop seen my work and requested that I make her one for her upcoming wedding. She also wanted a banner for her sweets table. I was super excited to create something for her special day! The color of her wedding is sunshine yellow. She shared some pictures of her bouquet and her wedding dress. With that inspiration, I created the banners. First I painted the burlap and canvas with sunshine yellow paint. Then I embellished with vintage lace, organza, satin ribbon, vintage floral buttons and of course some bling! I used my cricut to cut the letters out of silver glitter paper. Join myself & many more talented makers & artists for a fun summer evening of shopping. along with additional items for sale inside of A Little Known Shop. You will also be able to create at the free make & take table! 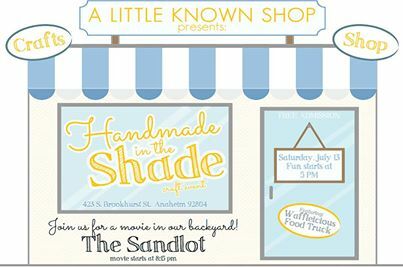 There will be live music, & the yummy Waffle-icious truck will also be there! behind Community. Bring a chair & a blanket. Popcorn & drinks will be provided! 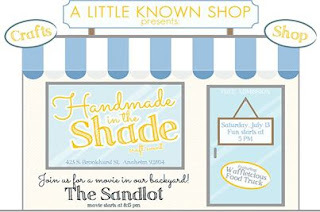 Event will be from 5-8pm, Movie starts at 8:15pm. Here is one of the projects for Crafty Night In w/Crafty Amiga. I will provide many color options & all the embellishments to customize the ornament to your liking. You will have many choices of lace and trim, buttons, paper flowers, beads & pearls, bling & glitter! I will have several inspirational quotes for you to choose from as well. Please see previous post for full details. on Friday, July 26, 2013 from 6 pm - 9 pm. Join me for an evening of Crafty Goodness! There'll be 3 projects to create. Refreshments & a light snack will be provided. Pay NOW with Paypal or your Credit Card! Stay tuned for sneak peeks of the projects you'll be creating! there's an awesome NEW retail store in Anaheim that exclusively sells all HANDMADE items. Lucky me, I am a vendor for the shop! If you're in the area, stop by. They are located at 423 S Brookhurst St, Unit M, Anaheim, Ca 92804. Tell them I sent ya! Follow me on Instagram for a chance to win a box of Ferrero Rocher chocolates and a set of Susan's Garden rose thinlits from Sizzix! This giveaway is in honor of Mother's Day! It is open to ALL followers. All you have to do is like the image and be a follower of my Instagram feed. Hurry! The winner will be announced tonight, Tues, May 14th, 2013 at 8 pm PST.